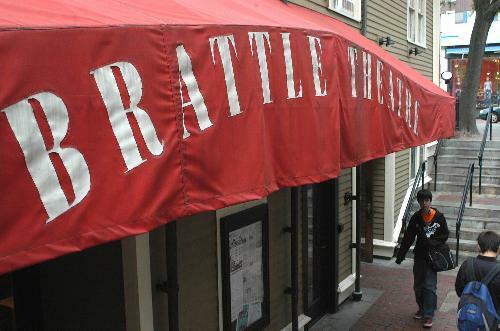 Protesters gathered outside Brattle Theater to protest Howard Schultz, the former CEO of Starbucks. Wielding signs with slogans like “a vote for Schultz is a vote for Trump” and chanting “Hey hey, ho ho, Howard Schultz has got to go,” more than 30 demonstrators gathered outside Brattle Theatre to protest the billionaire’s possible independent presidential bid. Schultz — the former CEO of Starbucks — visited Cambridge to promote his book “From the Ground Up: A Journey to Reimagine the Promise of America.” He told the New York Times in January he plans to travel the country on a months-long book tour before making a final decision on whether to declare an independent bid among a widening field of 2020 presidential hopefuls. 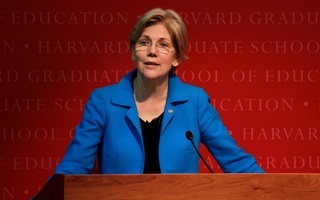 Schultz’s sold-out talk, hosted by the Harvard Bookstore, drew at least 100 audience members. The demonstration was part of a “coordinated effort across the country” by local chapters of Indivisible — a liberal grassroots organization — to oppose Schultz “at each and every single one of the book stops, or as many as we can,” said Monica R. Burke, the organizer of the protest and group leader for the Acton, Mass. chapter of Indivisible. Many demonstrators said they are frustrated with Schultz’s choice to identify as an independent, if he chooses to run. “I'm here because I want a different president than Donald Trump in 2020, and if Howard Schultz runs as an independent, he will split the Democratic votes, and we will lose,” protester Robin W. Parker, a resident affiliate of Quincy House, said. 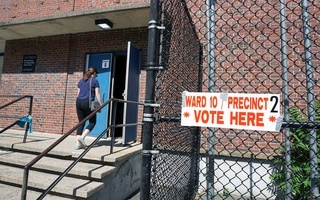 Adam M. Friedman, the director of political advocacy group Voter Choice Massachusetts, said independent candidates are evidence that the country’s two-party political system does not effectively represent voters’ wishes. “Howard Schultz is just one spoiler in a long line of other potential spoilers — we like to call them ‘so-called spoilers’ because people shouldn't be blamed for running, but unfortunately our two-party system breaks down when more than two people run, so people are being as pragmatic as they can by pressuring candidates to drop out,” Friedman said. Burke, too, said the two-party system is ineffective. “If you want to actually fix the system, and actually get to the point where we can actually get behind independents, what he should then do is be the poster child for ranked-choice voting,” she said. Inside the talk, Schultz conversed with moderator James Fallows, a national correspondent for The Atlantic. Protesters did not interrupt the event. Many attendees said they bought their tickets before Schultz’s announcement that he was considering a presidential bid and chose to come because they were eager to hear him speak about his book and his life. “Starbucks is a transformative company in the culture of the country, so I thought it would be interesting to hear him speak,” event attendee Debbie R. Silberstein said. Some audience members said they appreciated Schultz’s business expertise and admired his possible political aspirations. “He's a leader and has a lot of interesting things to say about the entrepreneur's journey,” Ann C. Mitchell ’94 said. “I thought it was cool, just on his stance on being independent and why he thought that was the right strategy to go about to make a difference and how Americans might take that as being something that could be more transformative and different,” Christine L. Blims said. Others, like Amy Gerber of Needham, Mass., said the talk left them disappointed. “My impression with him is that he’s a Republican who just doesn’t want to go in and try and take over the Republican nomination rather than just being a spoiler,” Gerber said. Schultz did not immediately respond to a request for comment Tuesday. During his talk, he argued he is not a spoiler candidate, according to Mitchell. When asked about the protests as he signed copies of his book for event-goers outside the theatre, Schultz said the demonstrators have a right to free speech. He did not comment further.